What person in their right mind would be able in the furthest stretches of reality call someone who without cause in a premeditated attack screaming Alua Akbar who shot and murdered 12 unarmed miltary personnel and 1 civilian, and wounding 32 others a Conscientious Objector? Has our Department of defense succumbed to the vile practice of political correctness found in dhimmitude, and accepted the tenants of sharia? A Conscientious Objector as defined "is one who on the basis of religious or moral principles refuses to bear arms or participate in military service." It cerainly appears that once again the justice for Hasan's viticms and thier families has been brought to a slow crawl in the prosecution of Major Nidal Hasan, the lone defendant in the murderous attacks of military and civilian innocents on November the 5th November 2009. And it appears that the Department of Defense has given this lawbreaker a dream motive to use an insanity plea and an excuse for his actions. According to infromation in this article from Pajama's Media , the Department of Defense has a new policy: "A shocking decision made by the secretary of the Army last month — in the case of an U.S. Army soldier with the 101st Airborne at Fort Campbell who refused to deploy to Afghanistan claiming that Islamic law prevented him from killing other Muslims — vindicates Fort Hood killer Major Nidal Hasan. He made identical claims and threatened that “adverse events” would occur if military officials didn’t accede to shariah principles." DoD has determined that these radicalized Muslims can after the fact claim being conscientious objectors. Nidal Hasan in no way fits this definition. 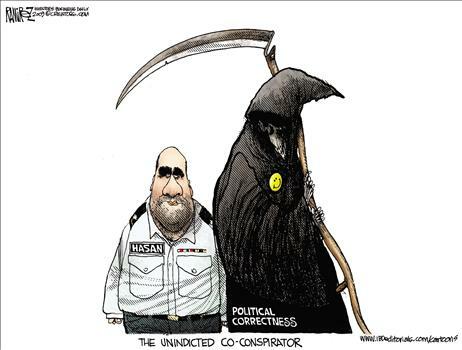 Major Nidal Hassan used a handgun known as a 'cop killer'. According to reports in Texas, he was clean shaven on the infamous day of the shooting and was screaming Alua Akbar as he fired repeatedly at unarmed personel and civilians. He used a FN Herstal 5.7 tactical pistol, a semi-automatic handgun, which is called a 'Cop Killer' in his infamous attack on unarmed miltary (Armed Forces personnel are forbidden to carry weapons on base (loaded or unloaded by military code for military personnel) and likewise civilian personnel at Fort Hood. The gun was legally purchased. Nidal Hasan was selected as a member of the transition team for the Obama Administration, "The task force was not officially affiliated with the White House. It was a project of the Homeland Security Policy Institute, an independent thinktank housed at George Washington University, aimed at drafting policy recommendations for the incoming Obama administration team. Further it was known that Nidal Hasan had email exchanges with known terrorist and jihadi promoter Al Alaki in Yemen "...No less worrisome is the report's account of the FBI's handling of the Hasan case. Here was an Muslim-American in the U.S. military who was in direct email contact with Yemen-based cleric Anwar al-Awlaki—someone well known in counterterrorism circles as being the intellectual godfather of previous domestic terrorism plots—but given only the most cursory of reviews by the FBI. How and why that happened is the meat of the senators' report..."
Washington D.C. 20510, February 2011called A TICKING TIME BOMB , published February 3, 2011, said, "...Our basic conclusion is as follows: Although neither DoD nor the FBI had specific information concerning the time, place, or nature of the attack, they collectively had sufficient information to have detected Hasan's radicalization to violent Islamist extremism but failed both to understand and to act on it. Our investigation found specific and systemic failures in the government's handling of the Hasan case and raises additional concerns about what may be broader systemic issues. (2) the government had [REDACTED] communications from Hasan to a suspected terrorist, [REDACTED], who was involved in anti American activities and the subject of an unrelated FBI terrorism investigation. This individual will be referred to as the "Suspected Terrorist" in this report. Islamist extremism while on active duty were known to government officials, a string of failures prevented these officials from intervening against him prior to the attack. • Evidence of Hasan's radicalization to violent Islamist extremism was on full display to his superiors and colleagues during his military medical training. An instructor and a colleague each referred to Hasan as a "ticking time bomb." Not only was no action taken to discipline or discharge him, but also his Officer Evaluation Reports sanitized his obsession with violent Islamist extremism into praiseworthy research on counterterrorism. counterterrorism investigations and are staffed by FBI agents and employees from other federal, state, and local agencies. A JTTF learned that Hasan was communicating with the Suspected Terrorist, flagged Hasan's initial [REDACTED] communications for further review, and passed them to a second JTTF for an inquiry. However, the ensuing inquiry failed to identify the totality of Hasan's communications and to inform Hasan's military chain of command and Army security officials of the fact that he was communicating with a suspected violent Islamist extremist - a shocking course of conduct for a U.S. military officer. Instead, the JTTF inquiry relied on Hasan's erroneous Officer Evaluation Reports and ultimately dismissed his communications as legitimate research. • The JTTF that had reviewed the initial [REDACTED] communications di smissed the second JTTF's work as "slim" but eventually dropped the matter rather than cause a bureaucratic confrontation. The JTTFs now even dispute the extent to which they were in contact with each other in this case. Nonetheless, the JTTFs never raised the dispute to FBI headquarters for resolution, and entities in FBI headquarters responsible for coordination among field offices never acted. As a result, the FBI's inquiry into Hasan ended prematurely. As noted, DoD possessed compelling evidence that Hasan embraced views so extreme that it should have disciplined him or discharged him from the military, but DoD failed to take action against him. Indeed, a number of policies on commanders' authority, extremism, and personnel gave supervisors in his chain of command the authority to take such actions. It is clear from this failure that DoD lacks the institutional culture, through updated policies and training, sufficient to inform commanders and all levels of service members how to identify radicalization to violent Islamist extremism and to distinguish this ideology from the peaceful practice of Islam. * The redactions in this report were required by the Intelligence Community pursuant to Executive Branch classificalion policies and are the result of intensive negotiations spanning three months. We take issue with the extent of these redactions, some of which we believe are unjustified, but we have consented to them in order to produce this report in a timely manner." 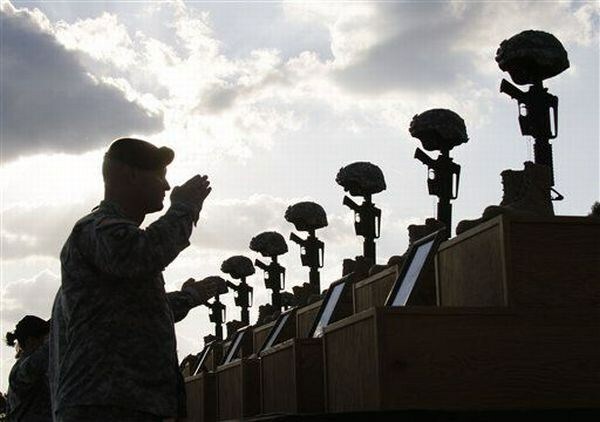 Here is a list of those innocent heroes, military and civilian who were going about their duties and business and whose lives were taken by Nidal Hasan on a beautiful clear fall day at Fort Hood Texas, November 5, 2009. *Was pregnant when she was shot and murdered. Will the families and loved ones and commrades in arms of the deceased and 32 wounded be waiting for justice like those of the USS Cole for 10 years? From my perspective it is too bad that the two police officers that shot and wounded Nidal Hasan did not shoot him dead. Since this will be a military court martial, who knows when Nidal Hasan will have his day in Military court. If ever there was a candidate for a firing squad, it is surely Major Nidal Hasan. I was outraged by this story before I was aware of the background. Thank you for the imformation. We have got to get busy making some noise, we have to stand up for what is right, stand up for those that signed up to fight for us, to stand up for that baby that never had the opportunity to breathe air. This man deserves no less than a firing squad and IMHO that is still too good.... But we'll leave the eternal ramifications to God, for He is the avenger of the innocent, He is just and true.